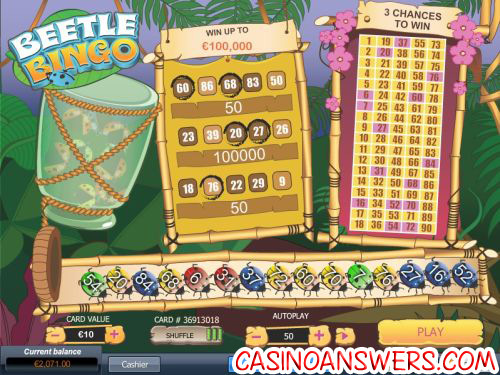 Beetle Bingo Scratch Card Guide & Review - Casino Answers! Beetle Bingo is a scratch bingo game developed by Playtech. You can win up to $100,000 playing Beetle Bingo. You can play Beetle Bingo at Jackpot Scratch. To play Beetle Bingo, first choose your card value. This will determine how much you wish to bet per game of Beetle Bingo. Bets are $0.50, $1, $2, $5 and $10. Once you have chosen your card value, hit “Play” to start the game. Once you have started the game, you can hit the “Shake” button on the jar at the left and fifteen beetles will fall out of the jar. Each beetle will have a number attached it. Once the beetles have all fallen out, you can click “Scratch” on each of the three scratch cards to reveal the game numbers. If you match all five of the numbers on a card with the numbers on the beetles, you will win a prize. The prize of each card will be listed below the card’s numbers. You have three chances to win! Alternatively, when you have a fresh card, you can hit “Scratch All” and your numbers will be revealed immediately. The beetles will then fall out of the jar. As a beetle that falls out matches one of the numbers in the game, that number will be circled on the card. You can win up to $100,000 playing Beetle Bingo. For this to happen, you must play the maximum bet of $10 per card and match all 5 numbers on each of the 3 rows of your card. Beetle Bingo has an autoplay feature. This is found in the center of bottom of the screen. Using this feature, players can play up to 99 games of Beetle Bingo automatically. You can stop Beetle Bingo’s autoplay feature at any time. Beetle Bingo is a very fun scratch game to play. It looks great with its graphics and fluid animations, has some nice sound effects and good play value. If you’re into playing a lot of instant win games, we suggest you try Beetle Bingo with no download required and a $7 no deposit bonus at Jackpot Scratch! Are players from the USA able to play Beetle Bingo at Jackpot Scratch? Jackpot Scratch is not a US-friendly casino. If you’re looking for a US-friendly online casino to play scratch games, we recommend you play at Rushmore Casino. How do I get my no deposit bonus from Jackpot Scratch? Jackpot Scratch offers a $7 no deposit bonus (also available in EUR or GBP) to all new players who sign up at their website. Do I need to download any software to play Beetle Bingo? Beetle Bingo is played in your web browser using Flash. If you don’t have Flash installed on your computer, you can download the newest version of Adobe Flash Player. What is a good scratch card to play? What is a fun scratch card?